Ateco's parchment triangles reduce the messy cake decorating cleanup. They are inexpensive and disposable. Simply make each triangle into a 9-inch cone and insert it into your favorite decorating tube. Each package contains 100 triangles, made of pure parchment. Since 1905, Ateco has supplied fine restaurants and bakeries with quality built, specialty baking tools. Ateco products are internationally renowned for their high quality. When you use Ateco products, you're not only enjoying quality craftsmanship, you're also enjoying quality design, the products are a result of over one hundred years and four generations of innovation and development. Ateco's parchment triangles reduce the messy cake decorating cleanup. They are inexpensive and disposable. Simply make each triangle into a 7-inch cone and insert it into your favorite decorating tube. 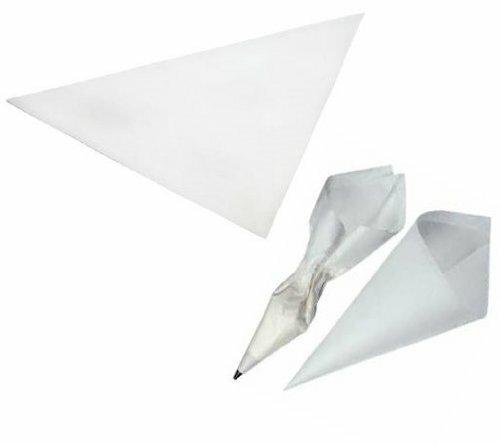 Each package contains 100 triangles, made of pure parchment. Since 1905, Ateco has supplied fine restaurants and bakeries with quality built, specialty baking tools. Ateco products are internationally renowned for their high quality. When you use Ateco products, you're not only enjoying quality craftsmanship, you're also enjoying quality design, the products are a result of over one hundred years and four generations of innovation and development. Authentic parchment paper is the professional's choice for convenience and quick bag preparation. make use-and-toss decorating bags ideal for small amounts of icing or brush striping. excellent wet strength for candy or a variety of icings. also great for smoothing iced cakes and transferring patterns. 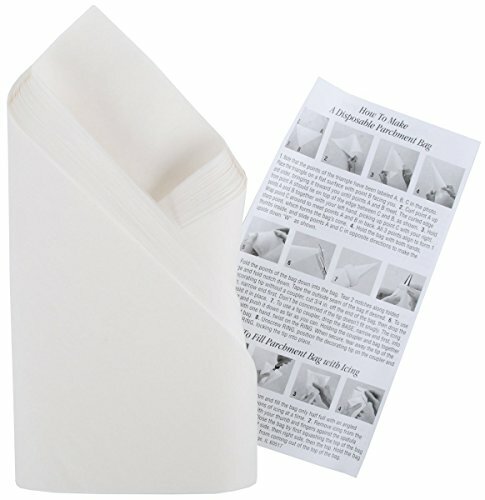 WILTON-Make your own disposable decorating bags with this grease-resistant vegetable parchment paper. The professional's choice for convenience and quick bag preparation. Includes (100) 15 triangles. 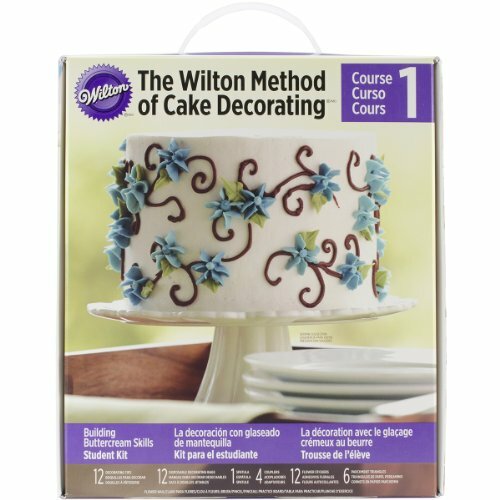 Wilton-Student decorating kit: course 1. Build your buttercream skills with this kit providing everything you need! 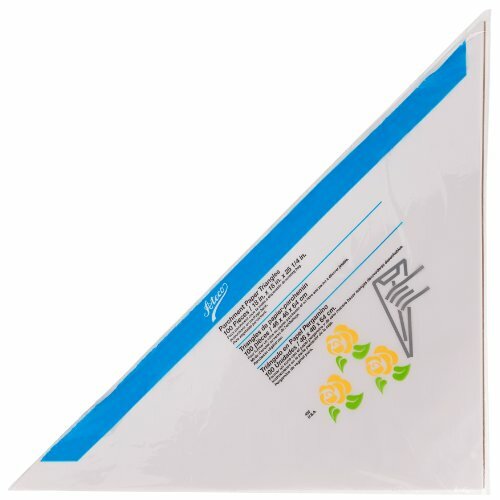 this 11x9-1/2x2 inch package contains twelve decorating tips twelve disposable decorating bags one 9 inch spatula one practice board with a stand practice sheets one decorator brush four couplers twelve flower template stickers one 1-1/2 inch flower nail and six 15 inch parchment triangles. Imported. 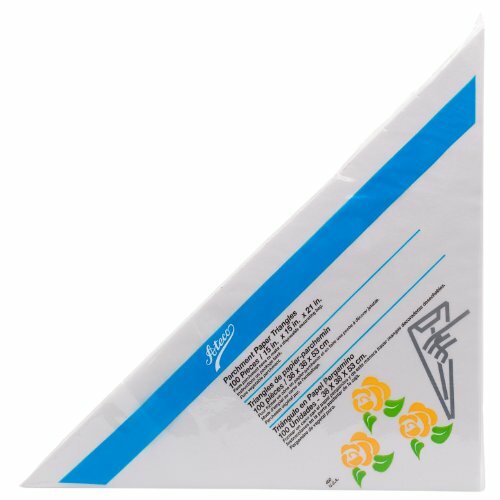 50 strong PME Parchment Triangles; perfect to prepare a range of different sized piping bags for royal icing, buttercream, chocolate & candy. These may be used with or without an adapter/coupler & piping tip. Comprehensive instructions are given on the packaging. Authentic parchment paper is the professionals choice for convenience and quick bag preparation. Make use-and-toss decorating bags ideal for small amounts of icing or brush striping. Excellent wet strength for candy or a variety of icings. also great for smoothing iced cakes and transferring patterns. Easily create triangles on parchment paper with the embossing tool triangle. The technique is simple: place the embossing tool triangle onto the parchment paper and emboss the triangle by gently pressing the embossing tool on the parchment paper. The tool can be used without a pattern so it can be freely applied in any of your creations. The embossing tool triangle has the new look and is carried out in the distinctive Pergamano Colors. Simplify the art of baking with these pre-cut parchment paper liners! Simply place in an 9-inch baking pan and you're ready to go! After baking simply lift the tabs to quickly and easily remove your baked goods--no more fumbling around with a knife. 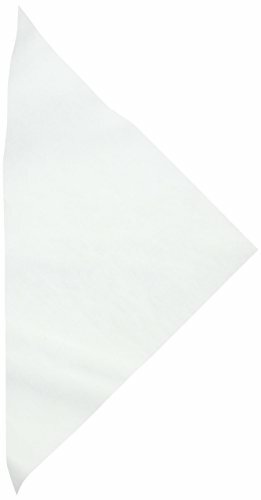 Liners are made of FDA approved unbleached parchment paper. It can withstand temperatures up to 428 degrees Fahrenheit. 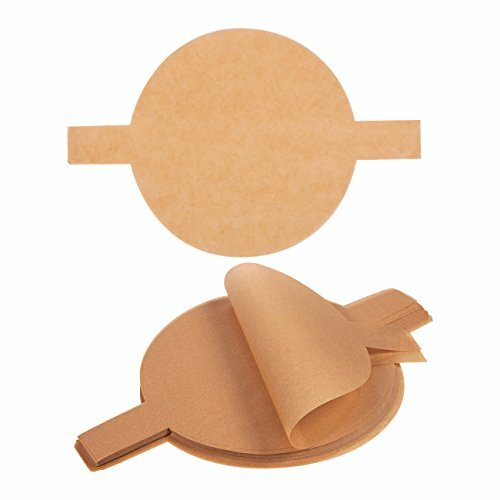 These liners are 9 inches in diameter and are perfect for 9-inch round cake pans. Copyright © Wholesalion.com 2019 - The Best Prices On Parchment Triangles Online.